Asa Stephens was born about 1813 somewhere in Georgia and died about 1900 in Decatur, Georgia. Dates for birth and death are estimated. He lived to be about 87 years old. Click on any of the News, Events, or Discoveries buttons above to see historical things that happened during Asa Stephens's life. These are only some of the major events that affected the life and times of Asa, his family, and friends. For example, Asa is 7 years old when The Act of April 24, 1820 abolished the land purchase credit system, fixed the price of public lands at $1.25 per acre, and set the minimum purchase at 80 acres. After a person purchased land, a final certificate was issued by the land office and sent to Washington DC to be verified and signed by the President -- a time consuming process. Public lands were most typically available through US treaties with Indians who agreed to be removed from their homelands. 4 1817 First Seminole war begins as Georgia backwoodsmen attack Indians just north of the Florida border. !817-1818. General Andrew Jackson invades the area. 6 1819 Rabun County formed. 7 1820 December 20 - Campbell and Randolph Counties formed. 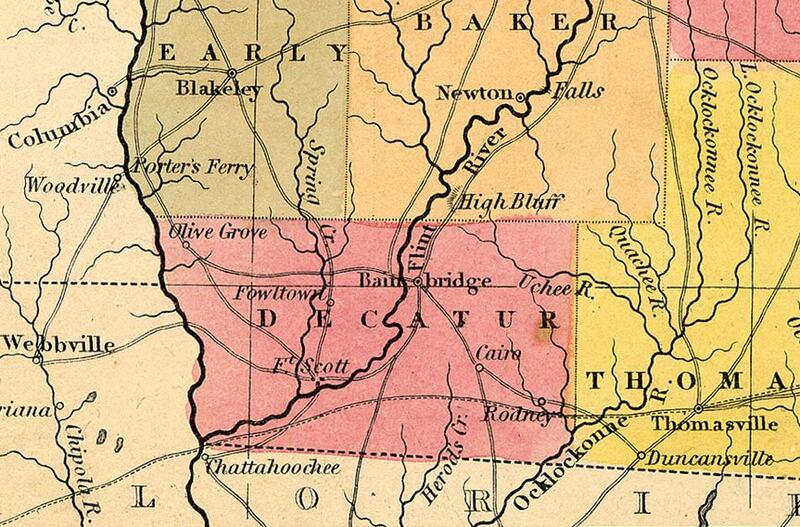 8 1821 May 15 - Dooly, Fayette, Henry, Houston, Monroe and Newton Counties formed. 9 1822 December 9 - Bibb, Dekalb and Pike Counties formed. 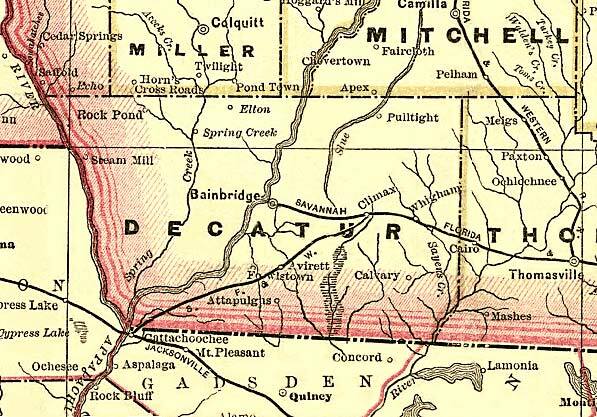 10 1823 December 8 - Decatur County formed. 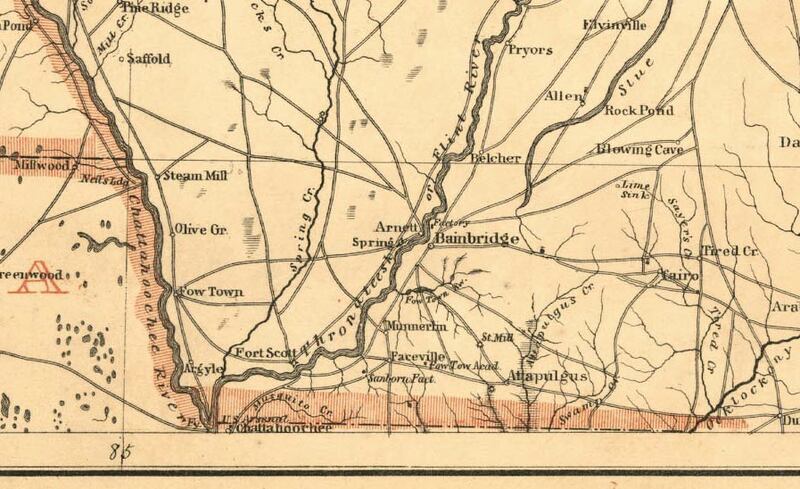 11 1824 December 15 - Upson and Ware Counties formed. 12 1825 Baker, Lowndes, Thomas, Butts and Taliaferro Counties formed. 13 1826 January 24 - Treaty of Washington abrogates Treaty of Indian Springs. The Creeks cede a smaller area and are allowed to remain on their lands until January 1, 1826. 14 1827 December 14, - Harris, Marion, Meriwether and Talbot. 17 1830 Cherokee, Heard, and Stewrt Counties are formed. 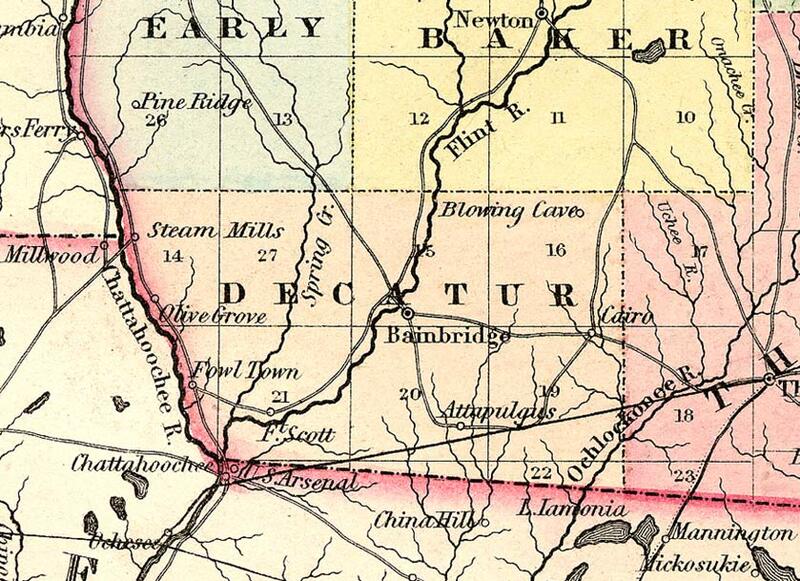 18 1831 Sumter County is formed. 19 1832 December 3 - Bartow, Cobb, Crawford, Floyd, Forsyth, Gilmer, Lumpkin, Murray, Paulding, and Union Counties formed. 20 1833 Walker County is formed. 23 1836 Seminoles massacre Major Francis L. Dade and his 103 man command. This starts the second Seminole War. February - Battle of Hitchity. March 27 - Colonel J.W. Fannin and his Georgian's executed by order of Santa Ana at Goliad on Palm Sunday. July - Battle of Brushy Creek. July 3 - Battle of Chickasawachee Swamp. July 27 - Battle of Echowanochaway Creek. 24 1837 Mcon and Dade Counties are formed. 37 1850 Gordon and Clinch Counties are formed. 38 1851 Clay, Howell, Polk, Spalding, and Whitfield Counties are formed. 39 1852 Taylor County formed. 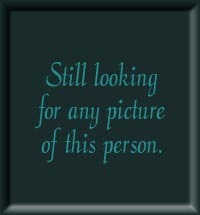 40 1853 Catoosa, Pickens, Hart, Dougherty, Webster, Flton, and Worth Counties aare creaated. 41 1854 Fannin, Coffee, Chattahooche, Charlton, and Calhoun Counties formed. 43 1856 Haralson, Terrell, Berrien, Colquit, Miller, and Towns Counties formed. 44 1857 Dawson, Milton, Pierce, Glascock, Mitchell, Schley, White, and Wilcox Counties formed. 45 1858 Clayton, Quitman, Banks, Brooks, Johnson, and Echols Counties formed. 57 1870 Douglas, McDuffie, Rockdale, and Dodge Counties formed. 62 1875 Oconee County formed. 82 1895 Wireless telegraph and the "antenna" are invented but it covers a very short distance. 87 1900 Freud publishes his book "The Interpretation of Dreams"
87 1900 The cause of yellow fever is discovered. It is proven that the fever is spread by mosquitoes. This rallies an effort to provide better mosquito control.